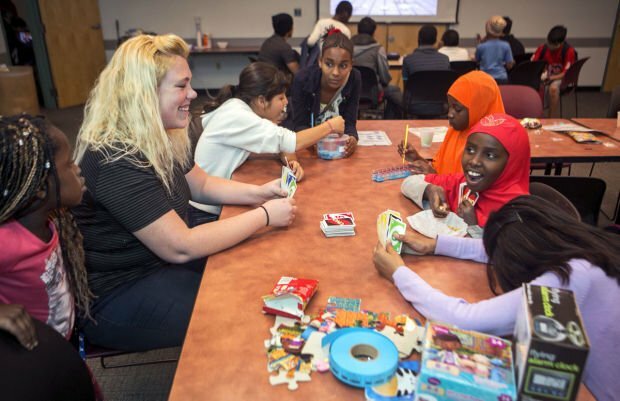 Jessica Zastera, left, laughs with the kids as they play a game of UNO cards at the Woods Memorial Library. Celebration of the library will be held 2-4 p.m. Saturday, Oct. 20. Jack Cornelius gets ready to install one of the “Flying Books” to the side of Woods Memorial Library. Artist Simon Donovan made 101 metal books, which are anchored at different angles. There is a special place in the Amphi neighborhood where books fly and 7-year-old girls travel through time. That place is Woods Memorial Library. Chance, a longtime customer, is thankful to connect with the community and access the internet. He calls the library a welcoming place where staff exceeds expectations. Many customers have fond and detailed memories of visiting the library as a child: a description of the original floor plan, a hilarious and defining moment during a magic show, a convincing request at the desk for “the grown up card,” and that most human experience — opening a book and discovering new worlds. Libraries help grow readers and writers, but also nourish future librarians. Amy Barnhill, a former Woods customer, is one great example. Woods opened its doors in 1968 as the North First Ave Branch Library. It was renamed Woods Memorial in 1970 to honor G. Freeman Woods, who served as a Tucson city councilman for eight years, was a Flowing Wells School Board member for six years, and served on the Library Advisory Board. Five decades later, Woods Memorial Library is more vibrant than ever and stands as a popular gathering place and community hub. You might join the monthly book club, reserve a packet of seeds, participate in a storytime, grab a healthy after school snack, or learn to speak English. That’s not all … you can have a library nurse check your blood pressure, design a marketable résumé, check out a Culture Pass, and even read to a dog. Come share your good memories with neighbors and friends on Saturday, Oct. 20, as we look back at the last 50 years. 2-2:20 p.m.: Listen to guest speakers, including George Woods, son of the library’s namesake, as he shares memories of his father, his legacy as Tucson City Councilman, and his unwavering support of libraries. 2:30-3 p.m.: Go way back with author Marge Pellegrino in a fun memory gathering workshop. 2:30-4 p.m.: Enjoy light refreshments and check out activity stations, including a classic car show and DJ Ricky Washuk spinning hits of the 60s. Don’t miss the hula-hoop contest, bubble making zone and craft table. If that’s not enough, there will be a book giveaway for teens and children, while supplies last, and a saguaro selfie station. Elizabeth Salper is a Library Associate at Woods Memorial Library. She is a poet and founder of Urban Poetry Pollinators, a volunteer group, committed to cultivating and curating poetry in public spaces.